The Cities Alliance is pleased to present the latest issue of Handshake, a quarterly journal on Public Private Partnerships (PPPs) published by the International Finance Corporation (IFC) focused on how PPPs help cities improve their infrastructure and put citizens first. William Cobbett, Cities Alliance Manager. [12 January 2012] -- The Cities Alliance is pleased to present the latest issue of Handshake, a quarterly journal on Public Private Partnerships published by the International Finance Corporation of the World Bank Group. This edition is particularly relevant to the work of Cities Alliance as it focuses on the how public-private partnerships help cities improve their infrastructure in ways that would be impossible without private participation, making urban areas more efficient and raising living standards. 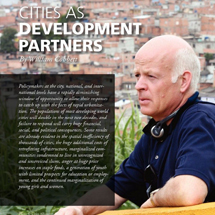 It features articles by William Cobbett, Manager, Cities Alliance on "Cities as Development Partners", and an interview with Clare Short, Chairperson Cities Alliance Policy Advisory Forum and former UK Secretary of State for International Development on "Managing Urbanization." Please click on this link to access Handshake.